In an ice cream face-off, how do Coolhaus ice cream sandwiches and Shake Shack Concretes fare? Sandwiching ice cream between cookies is not new. But Coolhaus, which operates a band of food trucks, takes the process one step further. The hugely popular ice cream purveyor serves up a rotating menu of flavors, like Blueberry Ginger and Red Velvet Cake. And they sandwich the frozen filling between flavor-filled cookies–from chocolate chip to gluten-free peanut butter. Plus, you’re encouraged to mix and match. Feel like a maple waffle white chocolate cookie on one side and a chocolate one on the other? Coolhaus is happy to oblige. It’s very fun, and the cookies, at least the double chocolate fudge ones I chose, are dense and intensely chocolaty. But there’s a problem. And it’s the ice cream. 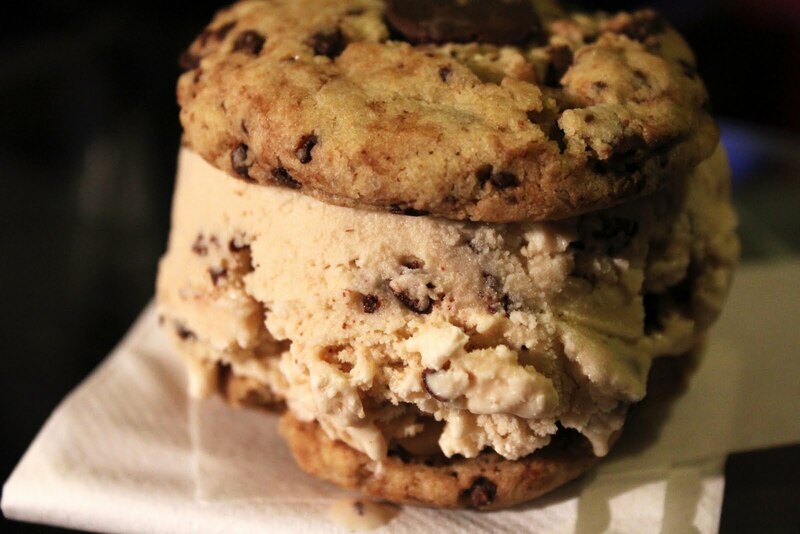 If you like yours with a thinnish consistency, you’ll enjoy the Coolhaus variety. I happen to prefer my ice cream dense and heavy. What’s more the chocolate cookies overwhelmed the salted caramel ice cream I chose as the filling. Next time I’ll order a less fully-flavored cookie and maybe the combo will work better. A few hours after my Coolhaus sandwich, I sauntered over to the Upper West Side Shake Shack, the one across the street from the Museum of Natural History. My hubby and I shared a Concrete with the awful name of Natural History Crunch-stellation. Monstrously studded with chocolate bits and chunks of chocolate covered toffee, it was way over the top on the mix-in scale. Maybe it’s a guy’s ice cream treat. My hubby loved it. But the frozen custard, as Shake Shack faithful will agree, is delicious. Our concrete was made with vanilla which boasted a striking vanilla bean taste. Plus the texture was silky and the custard boasted a substantial yet delicate mouth feel. The trucks are at various locations. Check @coolhausny. New York, Miami, Washington DC, Westport CT, Saratoga Springs NY. This entry was posted in Desserts, Ice Cream and tagged Coolhaus, Food Trucks, frozen custard, Ice Cream, New York City, Shake Shack on September 20, 2011 by Laura Weiss.